Three of the knife's blades, including the 2.5-inch high carbon stainless steel drop point blade, lock in open position. Both the flat tip and Phillips-head screwdrivers also lock open, eliminating any accidentally folding under pressure. Other blades offer refinements you'll find helpful and practical. The mini-serrations of the small pair of foldout shears self-sharpens as it's used, for example, and the teeth of the 2.75-inch wood saw are properly set for clean cutting without binding. The fingernail file blade works on softer metals as well as fingernails, and the flathead screwdriver blade also strips insulation from wire and opens bottle caps. If needed to open a can for a meal on the trail, there's an efficient can opener blade for that still common chore. The stainless steel awl also reams out the holes it punches, and the knife includes the very useful Swiss Army plastic toothpick and steel tweezers, housed securely in internal slots. Hook the tip with a fingernail to remove them from the handle and put them to use. The 3.25-inch-long Evolution Lock S18 also carries a wide selection of tools appropriate for the modern outdoorsman. At 3.1 ounces, the Wenger Evolution is perfect for pocket carry, but an optional belt sheath makes it even more convenient. 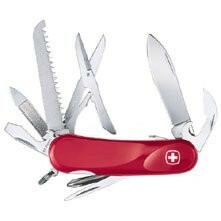 Try the Victorinox Hercules for a more robust model of the Swiss Army outdoorsman's knife.